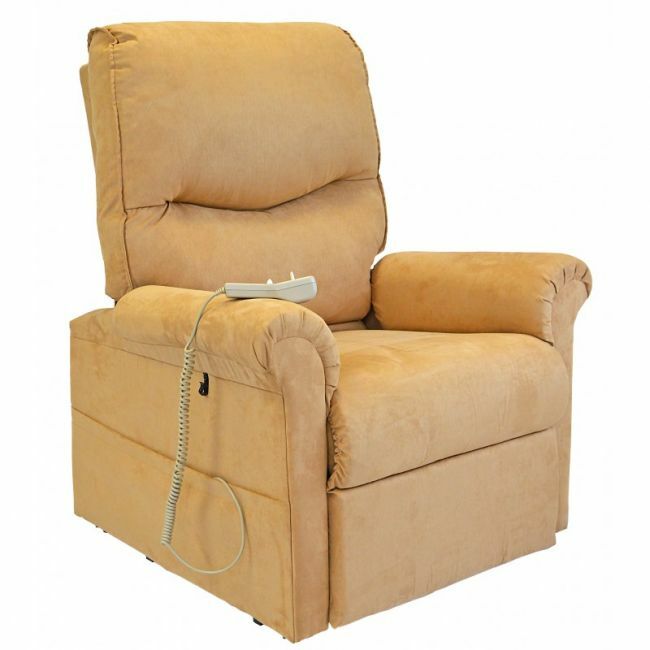 All the comfort and quality of a Pride recliner at a great price. The Pride LC107 dual motor riser recliner chair allows the backrest and footrest to be operated independently of one another using the handset. The footrest can be raised all the way up without the need to lower the backrest. The backrest can then be moved on its own to find the ideal comfort position. Upholstered in Sand colour micro suede-fibre fabric. Additional cushion to fill the gap between backrest and base when reclined. Simple to operate handset- Simply switch the slider from footrest to backrest and press the up / down. Distinct lift, rest and recline action. Smooth and quiet operation. Supreme comfort snooze position. Stylish design to add to any decor. Width - 89cm / 35"
Depth - 100cm / 39"
Seat Height - 48cm - 19"
Seat Width - 53cm - 21"
Backrest Height - 70cm / 27.5"
Length Fully Reclined: 183 / 72"
Armrest Height - 18cm / 7"